(Los Angeles, Calif.) – Razer™, the world’s leading lifestyle brand for gamers is collaborating with 3BLACKDOT, the leading Influencer-driven studio, and AT&T to produce the RIVAL X RAZER Holiday Showdown. This two-week event will feature 3BLACKDOT and Section Studios highly rated arena battle mobile game, “RIVAL: CRIMSON X CHAOS”. 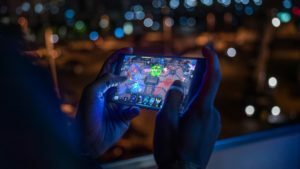 Participants will have the opportunity to play RIVAL: CRIMSON X CHAOS for a chance to win over $150,000 in total cash, Razer Phone 2, and other prizes. “We’re thrilled to help bring the RIVAL X RAZER Holiday Showdown to gamers, culminating with the championship event at our newest L.A. retail location,” said Shiz Suzuki, assistant vice president of AT&T Sponsorships and Experiential Marketing. “Our commitment to gamers is all about enhancing their experience. We’re excited to see that come to life through this tournament where fans will have the opportunity to win cash and prizes, including the Razer Phone 2 – just like the pros.” AT&T is reaching customers wherever customers are, from same-day delivery to new retail locations and formats including mobile stores and pop-up locations. They recently worked with Razer for carrier support of the Razer Phone 2, starting with west coast AT&T customers having the opportunity to demo and purchase the product in their various retail outlets. The Razer Phone 2 is also available from ATT.com. Razer Phone 2 is the flagship gaming phone with 120Hz Ultramotion™ display, dual front-firing speakers powered by Dolby Atmos, allowing for immersive gameplay and entertainment viewing on the go. Additional new features include wireless charging, water resistance, illuminated Razer Chroma logo and an upgraded processor with vapor chamber cooling. Fans looking to compete in this exciting tournament can download RIVAL Crimson X Chaos from the Play Store on Android devices and App Store on OS devices or by going to www.rivalcrimsonxchaos.com. For additional information on Razer Phone 2, please visit www.razer.com/mobile/razer-phone-2. To those interested in attending the event, the AT&T Store at 800 Parkview in El Segundo, CA will host the finals of this inaugural event. Razer™ is the world’s leading lifestyle brand for gamers. The triple-headed snake trademark of Razer is one of the most recognized logos in the global gaming and esports communities. With a fan base that spans every continent, the company has designed and built the world’s largest gamer-focused ecosystem of hardware, software and services. The award-winning hardware of Razer includes high-performance gaming peripherals, Blade gaming laptops and the acclaimed Razer Phone. Razer’s software platform, with over 50 million users, includes Razer Synapse (an Internet of Things platform), Razer Chroma (a proprietary RGB lighting technology system), and Razer Cortex (a game optimizer and launcher). Razer services include Razer zGold, one of the world’s largest virtual credit services for gamers, which allows gamers to purchase virtual goods and items from over 2,500 different games. Founded in 2005 and dual-headquartered in San Francisco and Singapore, Razer has nine offices worldwide and is recognized as the leading brand for gamers in the USA, Europe and China. Razer is listed on the Hong Kong Stock Exchange (Stock Code: 1337). 3BLACKDOT (3BD) is an Influencer-driven Collective, Studio, Production and Marketing company delivering audience engagement, brand value, and entertainment properties harnessing the power of Influencer communities around the world. 3BD is comprised of some of the largest YouTube Influencers in the world who garner hundreds of millions of monthly views. 3BD’s team has integrated brands into over 2500 Influencers’ content and worked with a myriad of leading consumer brands including: Disney, Volkswagen, and Electronic Arts (EA). 3BD believes that the future of digital media and communication lies in peer-to-peer recommendation. 3BD is at the forefront of a worldwide shift in consumer behavior, where Influencers will be the discoverability guides of the future. 3BD and its partners will ultimately help consumers cut through the clutter of overwhelming digital media choice and intend to lead this seismic global change. For more information, please visit us at https://3blackdot.com/. We help family, friends and neighbors connect in meaningful ways every day. From the first phone call 140+ years ago to mobile video streaming, we innovate to improve lives. We have the best network according to America’s biggest test.1 We’re building FirstNet just for first responders and creating next-generation mobile 5G. With DIRECTV and DIRECTV NOW, we deliver entertainment people love to talk about. Our smart, highly secure solutions serve over 3 million global businesses – nearly all of the Fortune 1000. And worldwide, our spirit of service drives employees to give back to their communities. 1Nations’ Best Network: Based on GWS OneScore Sept. 2018. Excludes crowd sources studies.